Watershed activities across Oregon are funded by Capacity Grants from the Oregon Watershed Enhancement Board, authorized by ORS 541-906, Division 40 Watershed Council Support, Watershed Council Operating Grants. These grants help pay for a Coordinators time, some technical and administrative needs. The Wasco Co. SWCD fills the role of Fiscal Sponsor for the financial management of the the grant, picks up incidental additional costs not covered by the Capacity Grant, and often provides match funding for restoration grants. In 2014, in an action to more make more efficient use of funding in the face of a plethora of watershed councils to support across the state, OWEB revised it's Capacity Grant Program. The result is the Outcome-Based Watershed Council Operating Capacity Grant Program. Watershed Coordinating Boards were formed as watershed council governing body who have the responsibility to ensure that the watershed councils meet legal requirements, support successful achievement of council goals, and to create structure, policies, and procedures that support good governance. The Coordinating Board will prioritize watershed projects and input those needs into the Conservation District's Area Plan for technical assistance and funding. The first order of business for the watershed councils was to complete watershed assessments for the major watersheds in Wasco County. These documents would be vital in helping to guide future restoration activities by identifying historical conditions of the watersheds. The Conservation District drew on the services of Americorps for the manpower needed to conduct the extensive research necessary to complete each assessment. The assessments not only describe the socio and economic background of each watershed, they also delve into historic conditions, land use, stream conditions, and other aspects of the watershed as a whole. Wasco County's rich history archived by the Columbia Gorge Discovery Center and Museum, as well as local historical societies provided a wealth of information to draw upon. 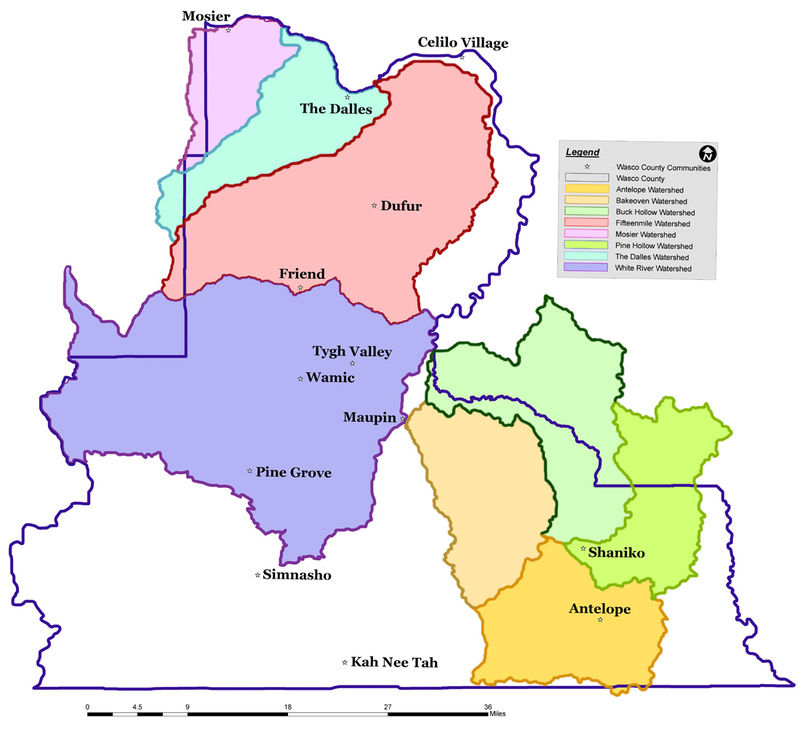 The Mosier Watershed Assessment was completed in 2002, Fifteenmile and The Dalles Assessments were completed in 2003, followed by White River in 2004, and Bakeoven in 2005. Assements for each watershed can be accessed via the Site Map and from each individual watershed council page. Abbie Forrest, the District's Watershed Coordinator, works with the Coordinating Board and watershed councils to coordinate their activities. Both the Coordinating Board and councils operate under a unified set of by-laws and use an overarching Action Plan based upon resource concerns from all five councils. In order to insure the Wasco Co. Watershed Councils have the technical support they need, the Conservation District assigned a Conservation Planner to each council. Voting council members of the councils are appointed by the County. You can use the map link in the lower left corner to find out what watershed you are in. If you are interested in becoming involved, watershed council meeting dates are posted to the right. To be put on a council's mailing list, please contact Abbie. Her contact information is posted below.